Patriotic Welsh 1 inch badge. This has the red welsh dragon with the text Cymru am byth! which translates to Wales For Ever! 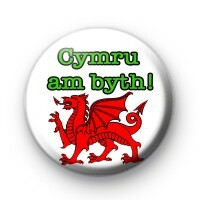 This is a great badge for Welsh national sporting events, schools or celebrating St David's Day.